Heat the oil in a flameproof casserole, add the lamb in batches, and brown over a medium heat for 5 minutes. Remove and set aside. Add the kidneys and cook for 3-5 minutes. Remove and set aside. Add the potatoes, carrots, and onions, and cook for 5 minutes. Remove from the casserole. Make layers of lamb chops, kidneys, and vegetables in the casserole, sprinkling with the sugar and a little salt and pepper, and putting the herbs in the middle. 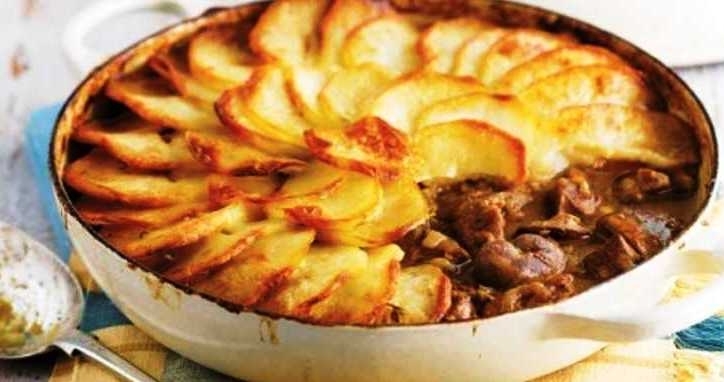 Top with a neat layer of potatoes. Pour in enough stock or water to come u to the potato layer. Cover tightly and cook in a preheated oven at 160℃ (140℃ fan, Gas 3) for 2 hours or until the meat and vegetables are tender. Remove the casserole lid, increase the oven temperature to 220℃ (200℃ fan, Gas 7) and cook for 20-30 minutes to brown the potato topping. Sprinkle with chopped parsley before serving. Omit the kidneys, and substitute 250 g (8 oz) swede for half of the carrots. Layer the meat and vegetables with 60 g (2 oz) pearl barley.